Become a Sport and Citizenship member and support the 1st think tank in sports ! Become a member of Sport and Citizenship ! 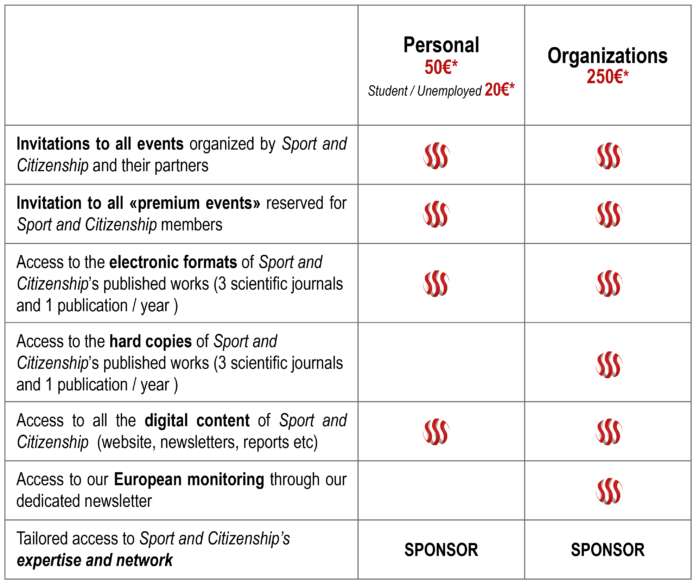 Your contributions and support enable Sport and Citizenship to bring its experts together, to organise workshops and conferences and to release articles and studies, all of which strengthen our propositions. By joining us, you become a member of Sport and Citizenship and have the chance to take part in the life of the Think Tank. This is a yearly subscription and coincides with the Think Tank’s financial year (from the January 1st to December 31st). In accordance with articles 200.1b and 238Bis of the General Tax Code, monies paid to public interest organisations and those that are considered gifts are eligible for tax reductions. Once your subscription has been received a tax receipt can be sent to you upon your request, which will allow you to declare your donation to the Tax Administration.